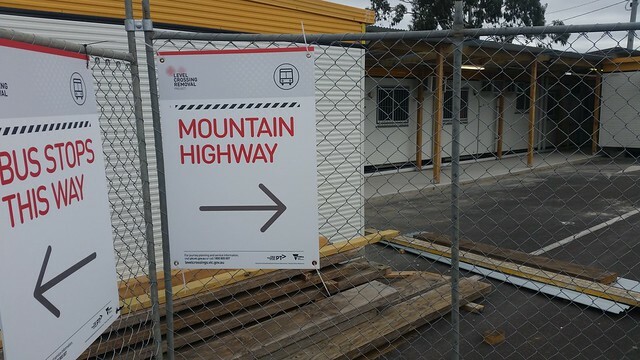 Recently I caught a train from Bayswater station, where things are getting underway to remove the Mountain Highway and Bayswater Road level crossings. This is a project I’ve been waiting for ever since I found out that grade-separation projects could be done when Boronia station was put underground in the late 90s. The station opened in 1889 as part of the original rail line from Ringwood to Upper Ferntree Gully, and the second platform opened in 1982 when the Ringwood - Bayswater section of the line was duplicated — Bayswater - Ferntree Gully having been duplicated in 1957. As part of the construction of Federation Square the Jolimont Railyard was “rationalised”, with 53 lines between Flinders Street and Richmond stations being cut down to only 12. Replacement facilities were built at other places around the network, including Bayswater Station, where there is a two-track maintenance facility and a stabling yard. This is likely the reason that, like Upper Ferntree Gully the station has “intermediate terminating facilities” (i.e. it’s a place that trains can stop that isn’t the end of the line) even though trains don’t finish here. The maintenance facility, and the two level crossings mean that this is going to be a bit more substantial than most of the simple cuttings that have been done over the past years. Almost every grade separation project I’m aware of has been done by lowering the whole thing under the road, nice and simple, and that’s exactly what they’re doing at Bayswater Rd. However, at Mountain Highway, while the track is being lowered, because of the maintenance facility it isn’t being lowered much — and Mountain Highway is also being raised. Also part of the redevelopment is the construction of a new station, closer to Mountain Highway — so they’re kicking out the car rental place, and Bayswater Rotary Club before putting in a new bus interchange, station building and a nice little plaza. Most importantly, that horrible underpass tunnel will be consigned to history. Also exciting for me, as a former member of 2nd/3rd Bayswater Scout Group is the news that the Scout Hall at the Bayswater Road end is safe. Apparently the remnant bushland that surrounds the hall meets some requirement for native plants which saves the whole plot from being transformed into carparks. Hooray!